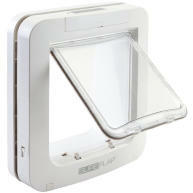 The SureFlap Microchip Pet Door Connect - like all SureFlap products - scans your cat or dog's microchip to keep unwanted intruders out, but when combined with the Hub helps you stay connected to your pet wherever you are. Have you wondered what time your cat comes in from their midnight stroll? Forgotten to lock the cat flap on bonfire night to keep your cat safe inside? Or just wanted reassurance that your cat was coming and going normally while you're on holiday? 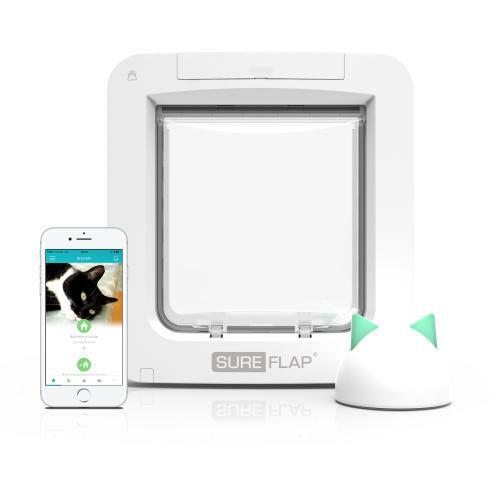 The SureFlap Pet Door Connect Hub links your cat flap to your smartphone to do all this and more! Receive notifications when your pet enters or leaves the house, monitor your pet's routine over time to watch out for sudden changes in behaviour, create a schedule to lock and unlock your catflap, manually control it all from the app whether you're home or away, and more. 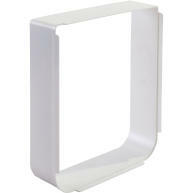 Glass Mounting Dimensions: - A circular hole is required to install the pet door in glass. 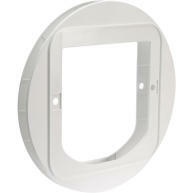 The optimum hole size is 300mm, but the pet door can be installed into holes up to 320mm in diameter. 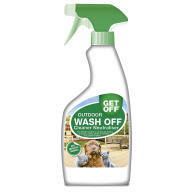 Does what it says on the tin, would buy again. Has one or two design weaknesses but Sure will sort out the only one that might matter if you contact them (see below for details). Our cats had no trouble adjusting to the noise of the lock, but they're young and yours might if they're older or timid. If required, there is a 'timid' mode that leaves the door unlocked for longer to give them more of an opportunity to get back in. There is an anti-intruder mode (off by default) that locks outbound access to prevent dexterous animals from pulling the door outward from outside. The flap is very strong; search youtube for "raccoon sureflap" to see this mode in action on an earlier iteration of the model and exactly how robust the door is. If a bigger, stronger raccoon can't defeat it, no cat will and dogs neither have sharp enough claws, the dexterity nor the temperament (so far as I know). IMO, the hub is worth the extra cost because it provides a 7-day history of how much time each pet is outdoors, when and how often they go in and out (which makes it easier to spot changes in behaviour) and it records instances where another animal was denied entry — but I'm a developer so like geeky things. The ability to remotely lock the door is kinda gimmicky, but might prove useful in some circumstances. Being able to set curfew by the app is considerably more purposeful, and the hub sets the current time automatically if you use curfew mode. The app doesn't reliably update and sometimes it is necessary to restart it, but the web site seems fairly solid. Sure's back-end servers sometimes have outages (which don't affect the door's operation but might not record all events). I haven't had it long enough to say if this is commonplace or if we were just unlucky that there was an outage when ours was installed. Users billed for data by volume, especially when abroad, beware: the app uses a fair amount of data in the background. How much will depend on how much you use it, how many pets you have and how much of the time you're not in WiFi range. For me, it seems about 130 MB/month of mobile data, and I'm not often not near a WiFi signal. You can use the website version from the phone's browser instead of the app if you need to be careful with data usage. The app meows when a pet goes in or out, most of the time. You can disable this in the phone's notification settings (on Android, at least, don't have an iPhone to try) if it is distracting. Likewise, if the status-indicating illuminated ears on the hub are a nuisance, you can dim them or turn them off altogether from the app or website. *Important:* the hub to flap connection is wireless, but the hub itself needs a wired Ethernet connection. If the nearest wired Ethernet socket is too far away from the door, there are Ethernet-over-power solutions that will probably do. The hub does not support WiFi, although the app can use WiFi to talk to Sure's servers. The flap unit itself has a few weaknesses that are minor but worth mentioning: It loses time and curfew settings when changing battery (not a problem if you have the hub). There is no mechanical lock on this model and it's not clear whether it unlocks itself when the batteries run low, so don't let it run out of battery. The locking latches are only spring-loaded which means a minority of pets can manage to open the door by depressing the latches and hooking the door inwards even when locked (eg during curfew). Yes, this happens — apparently it's rare, but frequent enough that Sure has a solution if you call them about it. They sent us, at their cost, a replacement flap and latch mechanism which put a stop to that. It's not hard to install for non-technical people, but you will need a screwdriver. Just be patient and gentle. Sure's customer service is superb. Even if now an American company (?) it started out in the UK and still has offices in Cambs (no, I don't work for them).